When it comes to grooming your pet, you might have already started to do it at your own home. Apart from utensils, such as dog grooming gloves, you will need a dog dryer too! The best dog dryers will save you time while drying the hair of your pet efficiently! You will need to invest in a high-quality one, as this makes them long-lasting and durable. Some dryers even come with features, such as light massagers and cool designs and colors! Make sure to choose a dog dryer that makes you and your pet happy! This dog dryer comes with a 21-hole comb nozzle, which will help you dry the hair of your dog half as quick! It comes with a cover that insulates heat so that you will be able to use it even in hot summer, without feeling a thing. 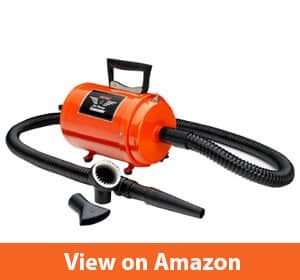 The flexible hose of this product is at 2.6 to 7.9 FT and its power cord is adjustable up to 2.5 FT. You can also adjust the airflow on this dog dryer from full speed to medium speed. The stepless adjustable airflow speed goes from 4921 FPM to 11023 GPM. Apart from the speed, you can also adjust the temperature of the dog dryer, to whichever fits your current need best. The temperature can be set from 96F to 167F. With the dryer, you will receive different types of nozzles which you can use when necessary. There will be a 7-finger nozzle, for double coats and large breeds, a wide slot nozzle, for drying the undercoat of especially large breeds, a standard slot nozzle- for small pets like puppies or cats and a cylindrical nozzle, which is best to be used when the weather is cold outside, as this nozzle keeps the airflow warm. This dog dryer is not only efficient, but it can also look good as it is available in different kinds of colors and your favorite color is in there probably too! This dog dryer is one that will last you long as it is made out of high-quality material and extremely durable. It is especially suitable for breeds who have a heavier coat. Although very heavy-duty, this dog dryer is extremely lightweight and portable. 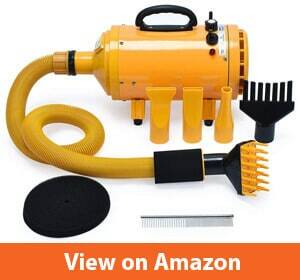 It comes with two motors, which will allow you to dry your dog half as quick! These two motors both also have their own filters. You can use the dog dryer with only one motor, for delicate drying, or use the two motors when you need to be added blowing power. 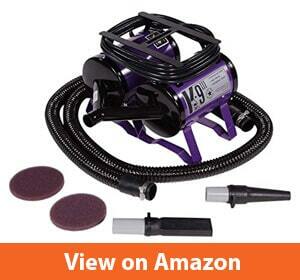 It comes with a 120 Volt outlet and has a very high velocity. This dog dryer will definitely assist you in grooming your dog, while only requiring less time to do so. While saving you time, it will leave your dog dry, preventing herewith any skin conditions. Maintaining this dog dryer is very easy! All you will have to do is remove the end caps of the drier to change the motor brushes. This process has been made easy to save you time and hassle as well! 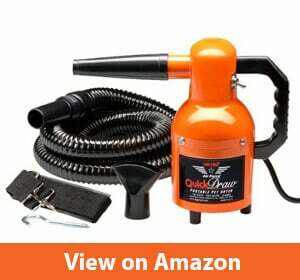 The Metro Air Force Quick Draw Dryer has been completely made out of steel, making this a very durable dog dryer. Although the construction is rather heavy, the dog dryer itself will be lightweight enough for you to easily carry it around with you when necessary. This dryer is believed to cut the drying time up to 70%! It has a 120 volt outlet, 8 amps, 950 watts, a motor with the horsepower 1.3, and the speed of airflow is at 18,000 ft/ min. This dog drier weights a total of 4.1 lbs. Using and handling this dog dryer has also been made easy! A nice feature you will know how to appreciate is the 6 ft. Stretch hose, which will allow you to move around your pet and dry every spot, to prevent infections and skin conditions. An air concentrator nozzle is included, as well as an air flare tool. It will also come with a shoulder strap and a mounting hook, which is 12 ft. Heavy duty. This is a feature that has been included specifically for the dog owner, making it easy for you to dry your pet without having to carry the dryer. The dryer also includes a 3-conductor cord. This dog dryer will allow you to quickly and effortlessly dry your dog. It is very compact and lightweight! This makes it a great dryer you can take with you wherever you go. It can be either used on the floor or on the table top, whether vertically or horizontally. It is suitable for dogs who have short hair and in general for breeds of smaller size. This dog dryer will allow you to dry the coats of your pets, while controlling the flow air and adjusting it to your own personal need. The dog dryer includes versatile attachments, an air concentrator, an air flare tool and a groomer rake. Not only will you be able to dry the coats of your pets, you will be able to groom it at the same time! This will help your pts coats stay away from harmful bacteria and it will bring you both closer as well! Grooming is known as an activity that will bond the dog owner and the dog more and more! The dog dryer comes with a 6-foot hose, which will allow you to efficiently dry every spot of your dog, even the hard to reach places. The motor is hard working with 1.17 HP and its filter can be easily replaced, when necessary. Use this air force commander professional dog grooming pet dryer to keep your pet well-groomed and dry! The dog dryer is light and compact, so you can easily carry it around. This makes it ideal for professional groomers as well who need to travel around to their customers. Using this dog dryer can be used either on the floor or on the table top. You can use it vertically or horizontally. This dog dryer is suitable for pets who have shorter hair and are smaller in size. The air flow of this dog dryer can be controlled at all times, so if the high speed is not comfortable to your pet, you can easily lower it so that it won´t bother your pet anymore. The efficiency of this dog dryer is very high and will be able to leave your pet dry, which is very important towards the health of your pet. A dry pet will not only feel and behave better, but this is also important to eliminate the possibility of bacteria forming or an infection. The dog dryer also includes a hose, which is 6-foot long and allows you to dry every spot of your pet. 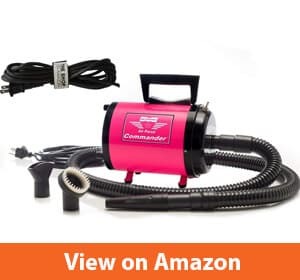 With this hose, your pet only needs to stay in place, while you move with the dryer around it and dry every place that still hasn´t been dried. This dog dryer comes with two motors, 4.0 PHP, Totals 229 CFM. This allows you to have enough air flow to dry even heavier coats. Due to the strength of the motor, the drying time will be 75% last! It is very fast and very powerful, while its body is completely made out of steel. 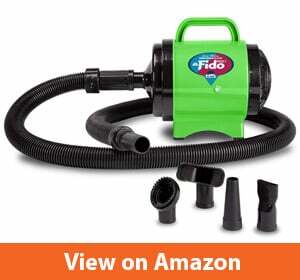 It comes with a flexible hose, with is also extremely durable. The hose is 10 ft. x 2,5 inch in size and the nozzle is a neoprene blower one. The conductor cord of this dog dryer is a 12 ft. Heavy duty conductor cord! This makes this dog dryer extremely durable, high in quality, efficient and long-lasting. The dog dryer itself weighs a total of 23 pounds and its measurements are: 27 x 14 x 9 inches. It is available in a standard black color. The voltage of this dog dryer lies at 110 Volts. If this outlet type doesn´t work for you, the same model of dog dryer is also available in other Volts matching to the area you live in. It has a horse power of 8.00. Use this dog dryer to completely dry the hair of your dog, keeping them healthy and bacteria-free. This dog dryer will save you not just time, but money as well. You can now wash and dry and groom your pet at home, without having to visit a grooming professional. A dog that is clean and well dried will leave your dog happy and stress-free. They will behave better and feel a greater bond to you too. If you take good care of your pet by yourself they will immediately feel closer to you. It is also an important step towards keeping the hygiene of your pet in order. A well-dried pet has fewer chances of getting allergies or infections. You can even use this dryer to blow way dirt that doesn´t necessarily require a full bath. This dog dryer not only de-sheds the coat of your pet, but it can also serve as a light massager, that your pet will know how to enjoy. This dog dryer has high velocity wind at 165 CFM, extremely powerful! The good thing about this dog dryer is that it doesn´t use heat to interfere with the higher body temperatures. This leaves your dog comfortable without hurting the skin of your pet. All in all, this dog dryer will serve you and your pet well, efficiently fulfilling its purpose. There are many different types of dog dryers and in the end, it comes to which one is best for your pet. There are some things that you will need to keep an eye for and that will end up being a big deal after using the dog dryer. Coat-size: You can immediately eliminate some dog dryers by looking at the coat of your pet. Some dog dryers are only suitable for smaller dogs with shorter hair, while other dog dryers are best for larger dogs with thick coats and undercoats. This will help you towards minimizing the use of a dog grooming brush. Design: Some dog dryers are handheld, which is very lightweight and easily portable. These are great if you need to move around with your pet a lot. Some dog dryers are mounted in a cage or are standing. These are mostly low-pressure dog dryers. Another common type of dog drier is the forced-air dryer, which has a handheld nozzle and the motor on the floor. Air flow: you also need to watch out for this one! Dog dryers don´t require too much air flow, as this could hurt the skin of your pet. It is best to choose a dog dryer with adjustable air flow, to make sure that the skin of your pet stays healthy, while the power of the air flow is strong enough to remove the dirt. Sound: Some dog driers can be extremely loud. So, if this is a major turn-off for you, make sure to get a dog drier that is rather quiet. While, they will never be completely silent, some dog dryers use modern techniques of silencing. Easy to maintain: it is important to know that the filters of dog dryers will need to be cleaned, so you should get a dog dryer whose filters are easy to change. Should I use dog grooming hair dryer? After grooming your dog, if you make a bath for it, you have to dry its hair as soon as possible. A dog grooming blow dryer can help you in this stage and you have to use it to your beloved dog. Choosing the right tools for grooming your pet are important, as they will help you not only take good care of your pet but save you time as well. Dog dryers nowadays don´t just simply dry, they will also help you groom and some can even replace dog combs. Once you know the coat of your pet, it will be easier for you to find a dog drier that is best suitable for it. With the right dog shampoo and dryer, your healthy dog will be a happy dog and one should always try to take care the best way possible for our pets!